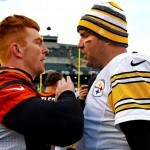 Home AFC North	Will Andy Dalton finally slay the Dragon that is the Pittsburgh Steelers? 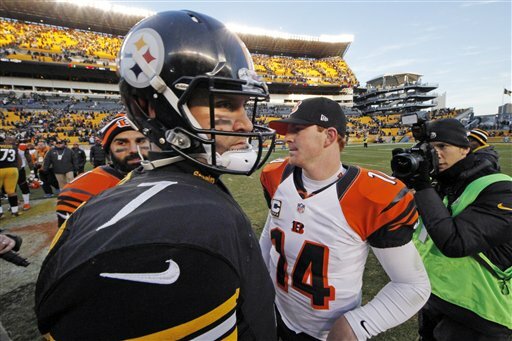 Will Andy Dalton finally slay the Dragon that is the Pittsburgh Steelers? Andy Dalton is on a tear. He has won his first six 2015 starts, thrown for 1,761 yards, 14 TDs and only 2 INTs. Is passing at a rate of 9.12 yards per attempt and has a 116.1 passer rating. Still many will say that it’s a fluke; the product of a good offensive line and good receivers, not Dalton’s skill set. Why? They look at his entire body of work. Dalton has a career passer rating of 87.8, has thrown for closer to 7 yards per attempt and has thrown 113 TDs to 68 INTs. Not too bad when you compare him to the rest of the NFL. But, when you look deeper, it paints a slightly different picture. Dalton is 2-7, throwing 9 TDs and 11 INTs, in prime time regular season games and 0-4, throwing 1 TD to 6 INTs, in the playoffs as a starter. He’s thrown 81 TDs and 37 INTs and owns a 36-10-1 record vs non-AFCN competition. Against the teams that know him best, the Ravens, Browns and Steelers, Dalton has thrown 32 TDs to 31 INTs; far more pedestrian numbers He also owns a 12-13 record vs the AFCN, largely due to his dismal 2-6 record vs Pittsburgh. Dalton’s performance over his career vs the AFCN and the presence of Marvin Lewis are what still have people on the fence about whether or not the Bengals are for real this year. Ben Roethlisberger, by comparison, has had more even success versus the AFCN. Roethlisberger was playing very well before he went down to injury this year. Will he be rusty after a month of inactivity? Very likely, yes. But how close to his week one and two performances does Ben have to be for it to be an improvement over Mike Vick and Landry Jones? In my opinion, if he’s even close to ready, he’ll make enough of a difference to kick start the offense. I could go into the superior passing stats that reflect far greater efficiency of the unit as a whole when Ben is directing drives or I can key in on the one thing the Steelers have not been able to do, save the last 8 minutes of the San Diego game and the last 20 minutes of the Arizona game: sustain drives. After Ben’s injury in St Louis, the Steelers’ offense has gone 12 of 54 (22.22%) on 3rd down. With Vick guiding the offense: 7 of 39 (17.95%). Under Landry: 5 of 15 (33.33%). With Ben at QB the Steelers were the best 3rd down offense in the NFL going 21 of 32 or 65.63%. That is a gigantic, falling off a cliff drop off. Granted the Ben directed offense was 6 of 7 before he went down that day in St Louis, Le’Veon Bell’s first game back from suspension. However, the Steeler offense went 15 for 25 in the two games prior, without both Bell and Martavis Bryant in the lineup. If they had maintained anything close to that 60% efficiency mark on 3rd down after two games, they would still be far and away the #1 3rd down offense in the NFL. With all of the Killer Bs in uniform Sunday, I think we can expect a resurgence. Will it be as good as it was late in the season last year? Probably not. However, I think it will be good enough.